Hi guys! I’m back with another review today… though it may not be a review so much as a feels trip. I adore the ACOWAR series. I’ve followed since day one, been through its ups and downs, and barely survived the emotional rollercoaster that was A Court of Wings and Ruin (AKA: Pain and Feels and Suffering in the last book of a phenomenal series) So, imagine my complete and utter joy when this little beauty of a novella came out….. AND WE ARE NOW GETTING MORE ACOWAR BOOKS WITH THE SAME CHARACTERS. Okay, I’m perfectly chill. Totally fine. 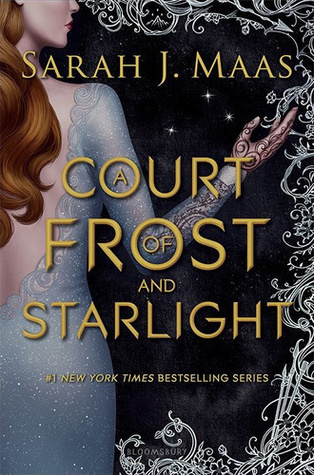 Anywho, back to the important part of this: A Court of Frost and Starlight is like a little window snippet into the insane lives of the Night Court as they try to rebuild and recover after the war with Hybern. It’s not necessarily a full novella, because it focuses more on showcasing little bits and pieces of them interacting over the Winter Solstice holiday. HOWEVER, it does completely set up the next books in the series (there is even a full chapter preview in the back *cue the pterodactyl screeches). This next mini-installment in the ACOTAR series was exactly what I needed to get myself through dead week and finals. It’s fun, heartfelt, and perfectly balanced between feels and fun. Between Feyre and Cassian attempting to drunk decorate to Amren being called an angry snowball, there are plenty of laughs to be had and beautiful memories waiting to be made. While it’s not all sunshine and rainbows, the general feel of the book is more light-hearted and celebratory. It’s enthusiastic and cathartic and beautiful. It has all the beats of the series we love without shoving it all down our throats. While A Court of Frost and Starlight isn’t necessarily a complete novel, it stands on its own two feet with its complete and utter mastery of our heartstrings. It’s fun, it will make you cry, and it will make your heart burst. I am so glad I got to, and will be able to continue to, jump back into Feyre’s life – because I sure as hell was not ready to let it go.